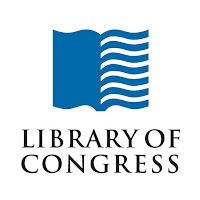 Earlier today, Peter Montoro alerted me to a new cache of manuscripts just published by the Library of Congress. Since Peter is more familiar with the contents than me, I asked if he would introduce them for us. In 1949–1950, Kenneth Clark led an expedition to Mt. 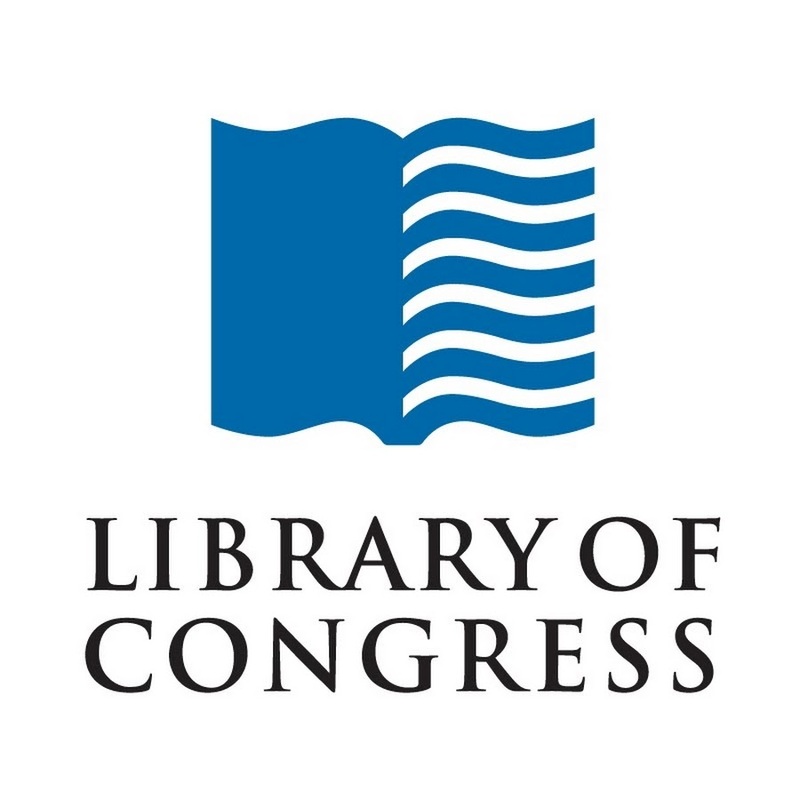 Sinai and Jerusalem that microfilmed over 2500 manuscripts on behalf of the American Foundation for the Study of Man, the Library of Congress, and the American Schools of Oriental Research. A full account of the expedition can be found here. Earlier this year, Peter Head alerted us to the fact that the Library of Congress had made the entirety of its Sinai Microfilm collection freely available online. A descriptive checklist for this collection is available here, and the full collection can be accessed here. The Jerusalem collection of the same expedition, containing slightly over 1000 additional manuscripts, has now also been made available and can be accessed here. This collection contains manuscripts in Greek (669), Georgian (125), Arabic (96), Armenian (32), and Syriac (27), as well as smaller numbers in other languages. The checklist for this collection can be accessed here. The numbers in the checklist appear to be drawn from the earlier and quite thorough catalogue by Athanasios Papadopulos-Kerameus (in Greek). Though the collection is diverse in date and contents, it does contain a good number of New Testament manuscripts, as well as a very large collection of patristic writings. Included among these are some of the oldest extant copies of the Homilies of Chrysostom, dating back to the 9th century. I’ve also been informed that the 1952–53 expedition to Athos, containing over 200 additional manuscripts is scheduled to be made available sometime this fall. As a sneak preview, the checklist for this collection is available here. Together these three collections form an enormous body of freely available manuscripts and should prove very useful to many lines of research. The LOC interface allows you to freely download these images at full resolution in either the JPEG2000(Jp2) or Tiff formats. While it is possible to click from image to image, downloading each one, I’ve found that it saves considerable loading time to get the link to one of the Jp2 files and simply change the numbers in the browser bar to get the needed folios. I have not yet been able to locate a PDF of the fifth and final volume of this series. Back in May, Pete Head noted that the ECM Acts would be out soon and I am happy to report that it has now been released. This marks another major milestone for the team in Münster. Along with the ECM, of course, there is the CBGM and I am happy to say that the new Genealogical Queries for Acts are now online. For Acts, we have data from all four phases of the team’s work. This gives unprecedented access to the development of the data over the last 4+ years. As the guide says, the data for phase four is still being checked and may be corrected still. So be aware of that. Perhaps most importantly, the fourth phase now comes with a completely refreshed interface, one which I have found to be a significant improvement over the previous one which is now almost a decade old. 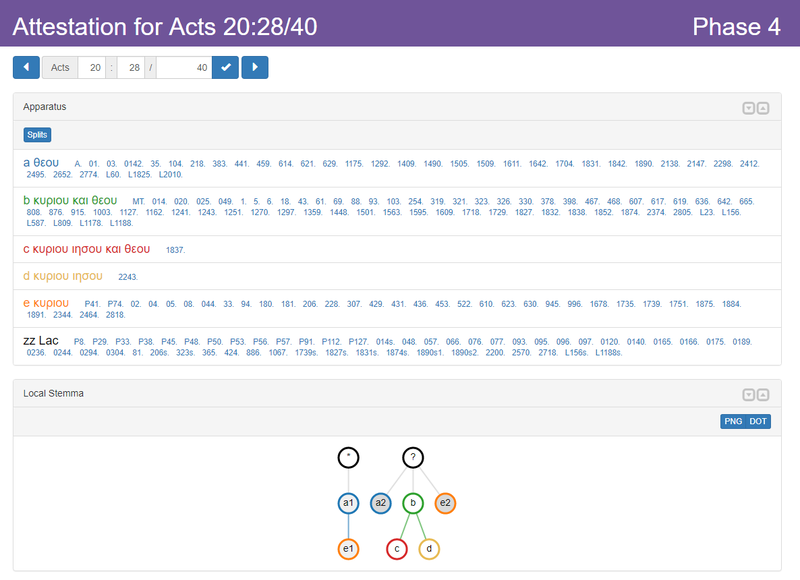 Besides the responsiveness, one thing I really like about the new interface is that you can use the CBGM queries without having the print ECM in hand. Just pick a chapter and verse and then you will get a list of the variants in that verse. Once you pick one, you now get a full apparatus right on the same page. This is extremely useful and roughly gives us a digital version of the ECM at least for the Greek evidence. Well done to Marcello Perathoner who did the programming for the new interface. And a big congratulations to the whole team in Münster. I hope you all get a nice rest before starting the next phase of the project! Alessandro Falcetta was my fellow PhD student under David Parker in Bham. 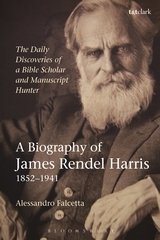 His dissertation topic was a biography of James Rendel Harris and it has just come out with Bloomsbury Publishing. This promises to add important information to the history of textual criticism and manuscript studies as well as other fields. 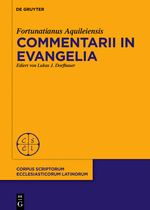 Dr. Houghton has published the (free) English translation of the Latin text edited by Lukas J. Dorfbauer. I do wish these had been published as a diglot rather than separate volumes. But well done to all involved! These kind of discoveries are what make textual criticism and the study of manuscripts so exciting. There is always the chance of new finds. Fuller obituaries will be given later, as impossible as it is to do full justice to him as a wonderful person and a remarkable scholar. His command of languages somehow useful to biblical textual criticism, from Arabic to Armenian, from Ethiopic to Old Dutch, was legendary, and rightly so. His very many articles must have driven peer reviewers to despair. They cover a wide array of subjects, though it can be fairly said that the Diatessaron and the Gospel of Thomas occupy a place of pride among them. The list of his PhD students is long, and all of them remember his self-effacing support, his high standards of scholarly rigour, and his friendliness, fully in line with Phil 4:5. 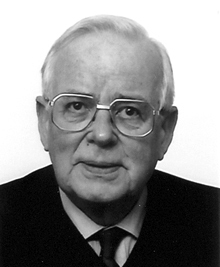 He counted Matthew Black, Bruce Metzger, and the Alands among his friends, to name but a few.< In 1998 he became emeritus professor of New Testament Studies at the Faculty of Theology, Vrije Universiteit, Amsterdam, and he was president of SNTS in 2001. In Amsterdam, at Vrije Universiteit, we had the privilege to count him as a regular participant of our New Testament Colloquium. Especially after the passing away of his wife, Hilda, in January 2013, he found renewed spirit in his scholarly endeavours, and became a source of scholarly anecdotes as well as an inspiration for the newer generations among us. He did not fade away, but was still fully engaged, in publishing, in exchanges, and in sharing his insights with students, not only in Amsterdam, but throughout the world. We will miss him sorely, remember him dearly, and aspire to emulate the scholarly and human example he set. The last time I had the privilege to meet Tjitze Baarda was at the SNTS in Amsterdam a few years ago where we had great conversations in the seminar and over coffee. He was one of those rare scholars who combine the highest level of scholarship with humility, generosity and a great sense of humour. He will be missed by many. Last week, I wrote about the charge made against some reasoned eclectics that they are guilty of praising the large number of NT manuscripts in their apologetic but then not actually using them in their text-critical work. For the details, see here. I had hoped the post would spark some discussion and it certainly did! It’s now at almost 100 comments. Clearly, it touched a nerve. One of the people I mentioned in my original post was Dan Wallace and I am happy that he responded on the original post. I thought his response deserved its own separate post and so I present it here, only lightly edited by Dan. Peter Gurry calls me an apologist. Gurry mentions that both Ehrman and Robinson have argued against the quantitative argument for various reasons. The quantitative argument in isolation is weak and misleading. 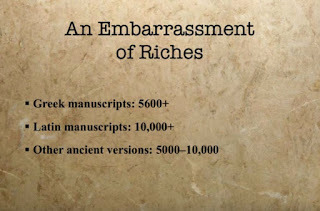 It’s not 5000+ MSS in any given place, and only 424 (Greek) MSS are from the eighth century or earlier. 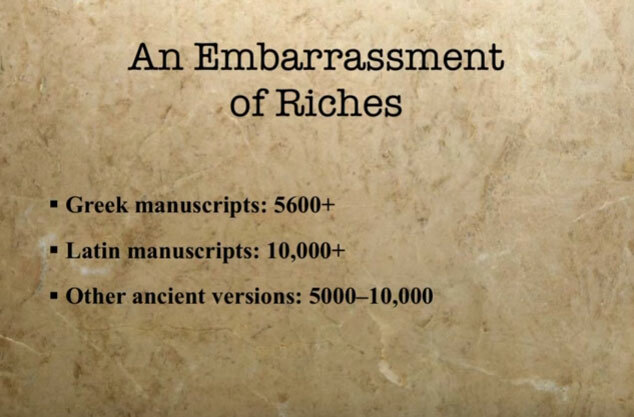 I am apparently speaking hypocritically when I invoke the numbers because most of these are Byzantine MSS and I presumably think the Byzantine text isn’t worth much. A good analogy would be that I consider the Byzantine witnesses to be counterfeit in thousands of places. 4-6 December 2018, Dirk Jongkind will be holding a masterclass aimed at evangelical leaders and NT teachers with a good knowledge of Greek to introduce them to the Tyndale House GNT as well as deepen their knowledge of the GNT. It will be in the beautiful context of Barcelona. Pre-reading required. At the time of writing there are only 18 more spaces left. 1. Why do we need an 'edition' of the Greek New Testament? QUALIFICATIONS: All participants will be actively involved in using the Greek New Testament in teaching or studies and have a good grasp, after at least two years of study, of Koine Greek. My post on the topic of the comparative argument for trusting our modern texts of the New Testament produced some good discussion. But one issue that got passed over in the ensuing comments deserves more attention and that is what I want to give it here. 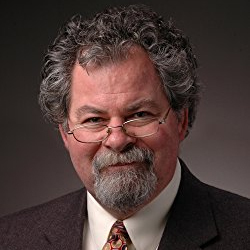 The issue is whether apologists like James White or Dan Wallace, for example, are being inconsistent for practicing reasoned eclecticism and for appealing to the vast number of Greek NT manuscripts. Wallace, for example, likes to refer to our “embarrassment of riches” for recovering the original text of the New Testament. But his practice of reasoned eclecticism seems to suggest that he is “embarrassed” in quite a different way by these riches because he doesn’t actually use them (see, e.g., the NET Bible). Apologetically he wants to have his embarrassingly-rich cake, but text-critically he has already eaten it. That is the charge anyway and it is one I have heard Bart Ehrman use in debate against Wallace. Granting that a working presumption of most eclectic scholars (including Ehrman) is that the vast bulk of NT MSS basically should be excluded as irrelevant for the primary establishment of the text, Ehrman’s statement [against the comparative argument] makes perfect sense. Rather than claiming some sort of text-critical superiority to the classics based on the sheer quantity of extant MSS, modern eclectics perhaps should acknowledge that their actual preferred witnesses for establishing the best approximation to the “original” NT text number only in the few dozens, as opposed to the several thousands otherwise set aside from serious consideration. I’d like to open this up to discussion again. Can reasoned eclectics make any apologetic appeal to the abundance of our NT witnesses without being inconsistent? If so, how? * “Appendix: The Case for Byzantine Priority” in The New Testament in the Original Greek: Byzantine Textform 2005, p. 568. Update: see Dan’s response here. What is a Catena Manuscript and Why should we Care? In the course of my research on the hexaplaric fragments of Job, I became immersed in its catena tradition. 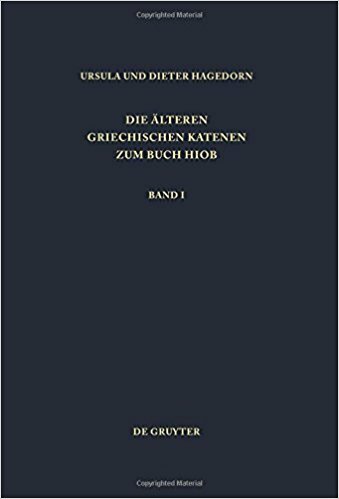 I also became aware that most handbooks and introductions to the Septuagint that mention these MSS did not describe them well, and they usually assumed too much knowledge on the part of the reader, especially the beginner, or worse, the specialist did not understand catena MSS either. 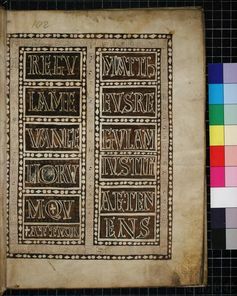 A picture is worth a thousand words, and a visual of these MSS allows one to understand commentary on them and what the “C“ symbolizes in a critical text’s apparatus. Knowledge of their material layout aids in understanding their contents. “Catena” is the Latin word for “chain,” and it will become evident below why these MSS were named as such. The details of the textual tradition of the Job catena need not detain us here. See my article on this topic for details, but one does not need to wade through it to appreciate the content of this post. 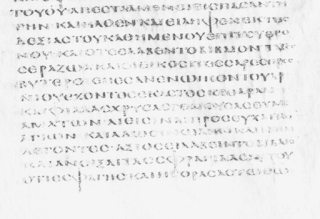 There are two types of catenae MSS: Marginal and Text. It is common knowledge that, at at several places in the book of Revelation, the main text of our standard Handausgabe (i.e. Nestle-Aland, 28th ed.) follows a singular reading of Codex Alexandrinus (GA 02; LDAB 3481). In principle, this is not inadmissible: a reading that is singular now needn’t have been so 1,500 years ago. Generally, though, some might find singular readings prima facie suspect, especially if they can be adequately accounted for on internal grounds. Now, for quite some time I’ve been fascinated about ways in which various facets of the copying process affect the rise of variant readings. At one level, copying seems like a simple and rather straightforward procedure: dip, look back (at the exemplar), write (a unit of text, whatever its length), look back, complete a line and start a new one, write, look back, write, look back, start a new column, write, look back, dip ... you get the idea. Seemingly uneventful. Or is it? All one need do is to browse through a few pages of Louis Havet’s Manuel de critique verbale appliquée aux textes latins (Paris: Hachette, 1911) to see that, in between these few rudimentary processes, all manner of things may occur which can make it to our apparatus critici as variant readings. καὶ ᾄδουσιν ᾠδὴν καινὴν λέγοντες· ἄξιος εἶ λαβεῖν τὸ βιβλίον καὶ ἀνοῖξαι τὰς σφραγῖδας αὐτοῦ, ὅτι ἐσφάγης καὶ ἠγόρασας τῷ θεῷ ἐν τῷ αἵματί σου ἐκ πάσης φυλῆς καὶ γλώσσης καὶ λαοῦ καὶ ἔθνους. The only one variation-unit recorded for this verse concerns the addition/omission and the placement of ἡμᾶς. 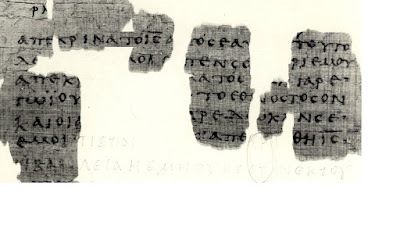 All the Greek witnesses but 02 contain ἡμᾶς before or after τῷ θεῷ. On the one hand, I could see why the editors would prefer the omission here, as the first-person pronoun makes for a somewhat awkward transition to v. 10 (καὶ ἐποίησας αὐτοὺς κτλ.). Personally, however, I find this explanation unimpressive. To begin with, the scribe of 02 may have followed the same logic and so drop the pronoun under the influence of the ensuing context (a very common scribal tendency). Another possible scenario has to do with the aforementioned mechanics of the scribal process. Given that the last line of a column 1 on the given page 02 ends with τω θ̅ω̅, it seems quite likely (to my mind at least) that the pronoun may have been dropped accidentally as the scribe was traversing to another column (again, a well-documented tendency). In short, I think we’d better print here what is a better-attested and more difficult reading whose origin is not easily accounted for by a scribal error. If you’re interested to read about this in greater detail, see my recent note: ‘“And You Purchased [Whom? ]”: Reconsidering the Text of Rev 5,9’, ZNW 108 (2017) 306–12. P.S. 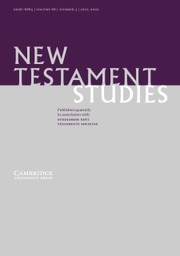 If you don’t have access to the article and/or don’t read footnotes, you’ll miss that, amongst NT editions, there are two that do not favour the singular reading of 02 at this point, namely Tregelles and the forthcoming Tyndale House Edition of the Greek New Testament (THEGNT). Here is Part 2 of my interview with Paolo Trovato. Read Part 1 here. For someone who isn’t an editor or working on an edition of a text, what do think is the main value of your book for them? Being able to easily detect the typos in a newspaper or a brand-new book. I am not kidding. This means realizing that, even in our time, any work hides or can hide within its pages a number of textual problems, born during the transmission, that is, the journey of the text from the author (via printing house or Xerox copies or internet) to the reader. Well, it is a rather long “moment”. Since 2007 I am working with a small team on a critical edition of Dante’s Commedia. The classification of the 600 extant MSS not reduced to small fragments took almost ten years, but now, thank God, we find ourselves in the more amusing and creative phase of fixing the text, for which we use 12 MSS only, the highest and most conservative in our stemma. In these very days I am working on Inferno, IV, but I already published provisional editions of Inferno, XXIII and Inferno, XXXIV on the web where I am getting precious feedback (see here and here). I have also completed some other cantos. Tommy and I are finishing up our introduction to the CBGM right now. It will be jointly published by SBL and the German Bible Society and they are hoping to have it out at the SBL meeting in November. There are some details for the book over on Amazon. But you’ll notice that there’s no book cover, which brings us to the point of this post. One of the fun things about this project is that SBL is letting us design the cover ourselves and we need some feedback on our final two. Which do you like better? This October, Charles Lee Irons will be speaking at Phoenix Seminary on what Paul meant by the “righteousness of God” (δικαιοσύνη θεοῦ). 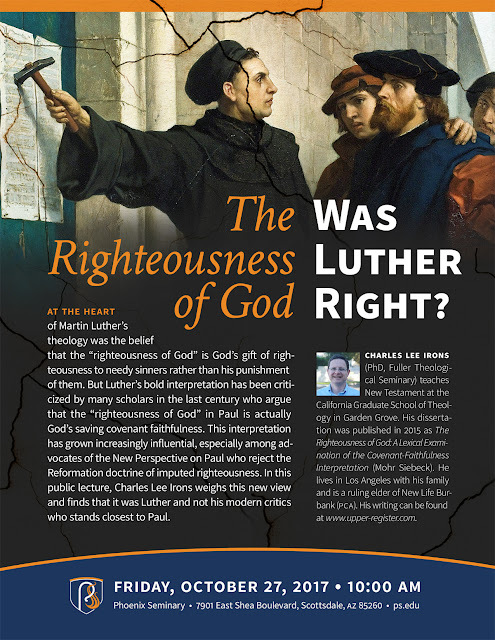 This was the topic of his book The Righteousness of God: A Lexical Examination of the Covenant-Faithfulness Interpretation (Mohr, 2015). His thesis challenges the interpretation of this term which has been crucial in the interpretation of Paul by scholars like N.T. Wright, Richard Hays, and others. For a positive review of Irons’s book, see Tom Schreiner’s here; for a strong critique, see John Frederick’s in JBTS (vol. 1) with a response from Irons. If you’re in the area, come join us. It’s free and open to the public. No registration needed. Register here. It is still possible that there is a correction in the gap in the shape of the addition of an extra ο, but I am fine to cite P66vid for the absence of the article. Writing in 1947, the Catholic scholar Charles DeVine seems to have foreseen the value of the NT.VMR. The only piece missing from his vision is the internet. No one can anticipate everything, I guess. True, we have critical editions which cite the main codices, but “to err is and the probability of error becomes greater when but a single text is in question. This prompts the thought, how fine it would be if all the principal codices of the New Testament were gathered in one place and could be compared at leisure and systematically. A vain desire! And yet in this age that has seen such tremendous progress made in the use of all forms of photography and electric facsimile, why should it be altogether beyond the realm of practicality to have codices preserved in microfilm or equivalent facsimile at some Catholic educational centre in America? In connection with an up-to-date filing-system, and with the co-operation of scholars, such an arrangement would be of inestimable benefit. It could also serve as the basis for a new and fully complete, Catholic, critical edition of the text of the New Testament. From Charles F. DeVine, “The ‘Blood of God’ in Acts 20:28,” CBQ 9, no. 4 (1947): 381–408. 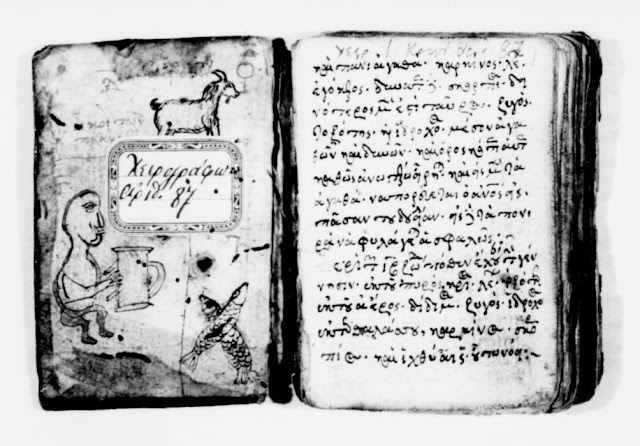 The present study of the oldest and most relevant extant manuscripts that contain 1 Cor 14.33b–35 shows that v. 33b (ὡς ἐν πάσαις ταῖς ἐκκλησίαις τῶν ἁγίων) is not connected with vv. 34–5. Scribes would consider 33b to be a part of 33a. 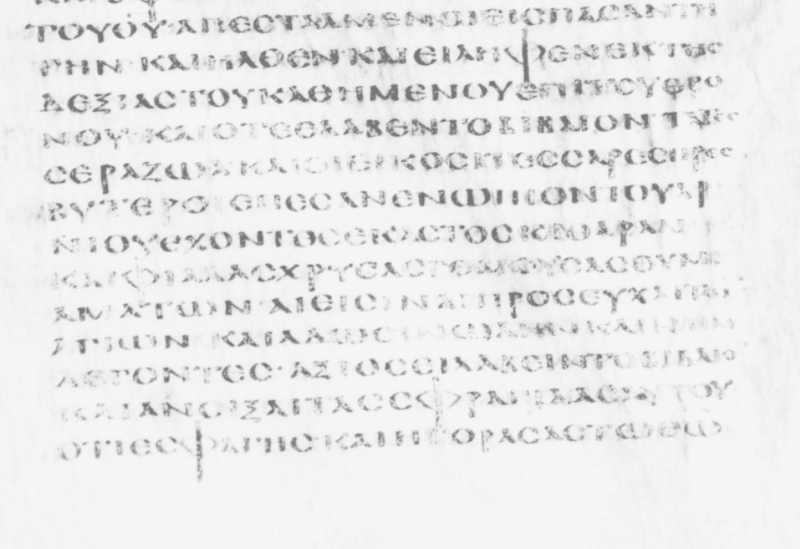 Manuscripts ℵ, A, B, Fuldensis, D, F, G, ms. 88* clearly read 1 Cor 14.34–5 as a separate paragraph. In these manuscripts, where vv. 34–5 are found after v. 40, v. 33b closely follows 33a. P46 and P123 are damaged and require reconstruction. Moreover, Greek New Testament editions that link v. 33b with v. 34 reflect exegetical decisions and are not based on external evidence. Broadly speaking, it seems that Lavrinoviča has made a plausible cumulative case, even if some of the details adduced seem problematic. For instance, Lavrinoviča mentions ‘slashes’ in P46, which she takes to be indicative of text-division, yet without citing any primary evidence or relevant secondary literature apart from Comfort’s general remarks in his Encountering Manuscripts. Here a reference to Edgar Ebojo’s recent thesis on P46 would have been useful. (By the way, the ‘slashes’ in Chester Beatty Biblical papyri are an interesting phenomenon, not exclusive to P46, and would probably repay some further specialised study.) In a similar vein, what the author does not seem to pay much attention to is that various phenomena listed as indicating text-division often appear inconsistent and sometimes downright iffy (e.g. vacant spaces can occur in the middle of a word; ekthesis occurs where you wouldn’t expect a ‘major’ break in the text’ based on the surrounding occurrences; a ‘slash’ used mid-sentence; etc). Despite these quibbles, I enjoyed Lavrinoviča’s approach, which sits well with the recent trends in Editionswissenschaft whereby editors increasingly consider the manuscript data in deciding matters such as orthography, punctuation, and text-structuring rather than merely imposing a system of their own or standardising solely according to modern conventions. From a reception-historical standpoint, MSS data such as those adduced by Lavrinoviča can come extremely handy for exegetical purposes. Few of us would doubt that the way the text is laid out considerably impacts one’s reading. Having said that, appropriating MS evidence to such end needs a healthy dose of critical scrutiny. What does it mean in this particular case? Well, even if one followed the said MSS in dividing the text after v. 33b, that says next to nothing about the (in)authenticity of vv. 34–5. This, of course, is not the line of argument pursued (directly at least) in the article, but it is not difficult to imagine someone jumping the gun here. It’s a pleasure for me to introduce our next interviewee in our ETC interviews series. Today I am speaking with Paolo Trovato who is a professor at the Università degli Studi di Ferrara in Italy. Prof. Trovato is best known for his work on Italian philology and particularly his work on Dante. He publishes widely on range of topics. I first encountered his work through his wonderful book on Lachmann’s method (reviewed here). That book has just been released in a revised edition and that provided a good opportunity for an interview. Enjoy! 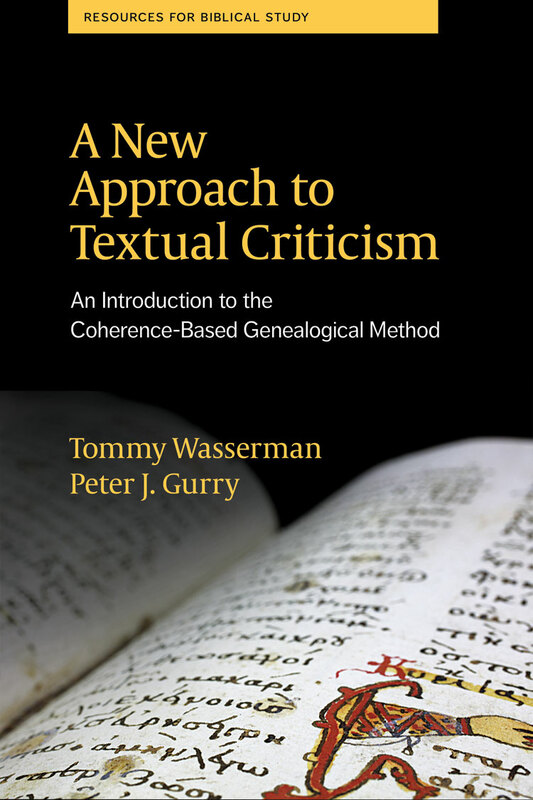 Textual criticism is not typically a popular pursuit in my experience. What led you to it in your own work? How did you come to it? 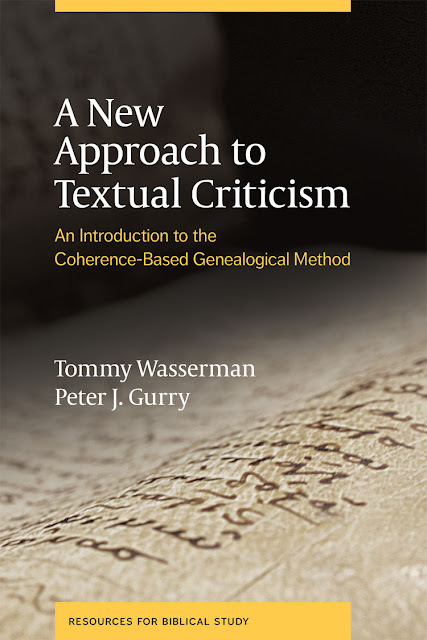 When I was a university student in the seventies, I wanted to became a literary critic and I thought that textual criticism was quite boring stuff. Aging, I went sick with all the silly hypotheses that we continuously utter and read about texts of the past and I decided that the most useful thing I could do for the sake of my studies was to repair the damages of the textual transmission or at least try to do so.